No matter who you are, you’ll constantly be looking for different things in your area. The phonebook is so 20th century and these days there are much better solutions available for finding things than that. With that in mind, now you can find everything that you need to find by using the Infospace FindIt Blackberry app. What is it that you really need to find? Perhaps you want some money and need to find a bank? Maybe you are interested in getting some grub and want a restaurant? Perhaps you need to get in some unadulterated consumer behavior and require a shopping mall? No matter what it is you are looking for, you’ll be able to search the database of Blackberry Infospace FindIt app and pick from thousands of different items. If you know the name of the place that you want to find, you can search directly for that name on Blackberry Infospace FindIt app. Once you’ve found an entry corresponding to what you are searching for, you can not only get in touch with the destination if they have contact information, but you can also see their location on a map and find out what’s near them to kill multiple birds with the same stone. If you don’t have a clue what the name is but you know generally what place you are looking for, perhaps browsing the listings based on category might be the way to go. 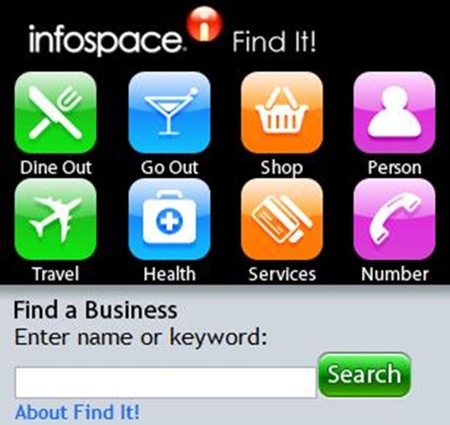 Infospace FindIt mobile app for Blackberry offers multiple categories including shopping, going out of the house and dining. The browsing is done based on location with entries that satisfy the categorical criteria being shown on a map relative to your current location. Infospace FindIt app for Blackberry gives you the chance to explore your neighborhood in a way that few other Blackberry apps will be able to match. Not only can you do everything listed above with it, but you can also look up maps to any location and get the shortest directions based on where you are and based on where you need to go. This kind of multi-purpose app could come in very handy for most people. As a result, we’ve decided to give Infospace FindIt Blackberry app a final score of 8 out of 10.